Jujuba is the common name for the Old World tree Ziziphus zizyphus (syn. Z. jujuba, Rhamnus zizyphus) in the buckthorn family Rhamnaceae, which is characterized by a palmately veined leaves, small yellowish flowers, and a olive-sized fruit. Jujube also is the name for this fleshy, edible fruit of commercial importance, particularly in China. The names red date and Chinese date also are commonly applied to this tree and species. 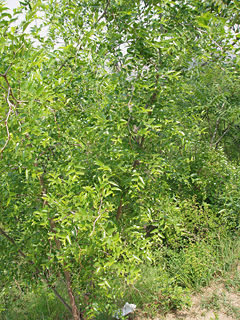 Some other plants in the Ziziphus genus also utilize the common name jujube, such as Ziziphus mauritiana, known as the Indian jujube. The Indian jujube is native to southern Asia (mainly India) though it is also cultivated and naturalized elsewhere in the dry tropics, notably in Africa. It is a serious environmental weed in Northern Australia. This article will be restricted to discussion of Ziziphus zizyphus. The fruit of Ziziphus zizyphus, which is so important for the plant's own purpose of reproduction, also provides larger values for wildlife as a source of food. Likewise, jujube provides humans with a rich source of vitamin C and is popular both fresh and dried. 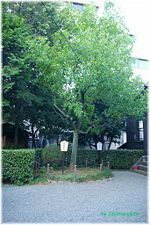 The flowering plant family to which the jujuba belongs, Rhamnaceae, the buckthorn family, is a large family of trees, shrubs, and vines, with 50-55 genera and approximately 870-900 species. The Rhamnaceae have a worldwide distribution, but are more common in the subtropical and tropical regions. The simple leaves can be either alternate and spiraling, or opposite. Stipules are present. These leaves are modified into spines in many genera. The flowers are radially symmetrical. There are five (sometimes four) separate sepals and five (sometimes four or none) separate petals. The petals may be white, yellowish, greenish, pink, or blue, and are small and inconspicuous in most genera. The five or four stamens are isomerous with the petals (that is, one stamen opposite each petal). The ovary is superior, and the fruits are mostly berries, fleshy drupes, or nuts. Some are adapted to wind carriage, but most are dispersed by mammals and birds. The Ziziphus genus contains about 40 species of spiny shrubs and small trees, distributed in the warm-temperate and subtropical regions throughout the world. The leaves are alternate, entire, with three prominent basal veins, and 2-7 centimeters long; some species are deciduous, others evergreen. The flowers are small, inconspicuous yellow-green. The fruit is an edible drupe, yellow-brown, red, or black, globose or oblong, 1-5 centimeters long, often very sweet and sugary, reminiscent of a date in texture and flavor. The best known species of Ziziphus is Ziziphus zizyphus, which also is listed as Ziziphus jujuba. It is a small deciduous tree or shrub reaching a height of 5-10 meters, usually with thorny branches. The leaves are shiny-green, ovate-acute, 2-7 centimeters long and 1-3 centimeters broad, with three conspicuous veins at the base, and a finely toothed margin. The flowers are small, 5 millimeters diameter, with five inconspicuous yellowish-green petals. The jujube fruit is an edible oval drupe, 1.5 to 3 centimeters long. A drupe is a fruit in which an outer fleshy part (exocarp, or skin; and mesocarp, or flesh) surrounds a shell (the pit or stone) of hardened endocarp with a seed inside. These fruits develop from a single carpel, and mostly from flowers with superior ovaries. The definitive characteristic of a drupe is that the hard, lignified stone (or pit) is derived from the ovary wall of the flower. The mango, olive, apricot, cherry, nectarine, peach, and plum are all examples of drupes. When immature, the jujube fruit is smooth-green, with the consistency and taste of an apple, maturing dark red to purplish-black and eventually wrinkled, looking like a small date (hence the name "Chinese date"). There is a single hard stone, similar to an orange or a tv olive stone (Rushforth 1999). This olive-sized fruit has a leathery skin (Herbst 2001). The jubube's precise natural distribution is uncertain due to extensive cultivation, but is thought to be in southern Asia, between Syria, northern India, and southern and central China, and possibly also southeastern Europe (though more likely introduced there) (Rushforth 1999). The species has a curious nomenclatural history, due to a combination of botanical naming regulations and variations in spelling. It was first described scientifically as Rhamnus zizyphus by Carolus Linnaeus in 1753, in Species Plantarum. Later in 1768, Philip Miller concluded it was sufficiently distinct from Rhamnus to merit separation into a new genus, in which he named it Ziziphus jujube, using Linnaeus' species name for the genus, but with a probably accidental single letter spelling difference, "i" for "y." For the species name, Miller used a different name, as tautonyms (repetition of exactly the same name in the genus and species) are not permitted in botanical naming. However, because of Miller's slightly different spelling, the combination correctly using the earliest species name (from Linnaeus) with the new genus, Ziziphus zizyphus, is not a tautonym, and therefore permitted as a botanical name. This combination was made by Hermann Karsten in 1882 (Clarke 1988). The Jujube has been cultivated for over 4,000 years for its edible fruit, and over 400 cultivars have been selected. The tree tolerates a wide range of temperatures and rainfall, though it requires hot summers and sufficient water for acceptable fruiting. Unlike most of the other species in the genus, it tolerates fairly cold winters, surviving temperatures down to about -15°C. This enables the jujube to grow in desert habitats, provided there is access to underground water through the summer. Virtually no temperature seems to be too high in summertime. 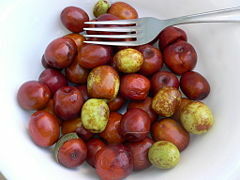 Jujube or Chinese date is eaten as fresh fruit, or dried and soaked in water before using; it is used in savory and sweet dishes (Herbst 2001). The flavor of the dry, yellowish flesh of the jujube is said to be rather prune-like (Herbst 2001). The freshly harvested as well as the candied dried fruits are often eaten as a snack, or with tea. They are available either red or black (called hóng zǎo or hēi zǎo, respectively, in Chinese). In mainland China, Korea, and Taiwan, a sweetened tea syrup containing jujube fruits is available in glass jars, and canned jujube tea or jujube tea in the form of teabags is also available. Although not widely available, jujube juice and jujube vinegar are also produced. In China, a wine made from jujubes called hong zao jiu (红枣酒) is also produced. Jujubes are sometimes preserved by storing in a jar filled with baijiu (Chinese liquor), which allows them to be kept fresh for a long time, especially through the winter. Such jujubes are called jiu zao (酒枣; literally "spirited jujube"). In addition, jujubes, often stoned, are a significant ingredient in a wide variety of Chinese delicacies. In Persian cuisine, the dried drupes are known as annab. The fruits are used in Chinese and Korean traditional medicine, where they are believed to alleviate stress among other conditions. The fruit may be ground to powder, or used in other means for this purposes. The Australian drink 1-bil makes de-stressing (or relaxing) claims on the basis of its jujube ingredient. Ziziphin, a compound in the leaves of the jujube, suppresses the ability to perceive sweet taste in humans (Kurihara 1992). The fruit, being mucilaginous, is also very soothing to the throat and decoctions of jujube have often been used in pharmacy to treat sore throats. In traditional Chinese wedding ceremonies, jujube and walnut were often placed in the newly weds' bedroom as a sign of fertility. In Japan, the natsume has given its name to a style of tea caddy used in the Japanese tea ceremony. In Korea, the wood is used to make the body of the taepyeongso, a double-reed wind instrument. Clarke, D. L. 1988. W. J. Bean Trees and Shrubs Hardy in the British Isles. Supplement. John Murray. ISBN 0719544432. Kurihara, Y. 1992. Characteristics of antisweet substances, sweet proteins, and sweetness-inducing proteins. Crit. Rev. Food Sci. Nutr. 32: 231-252. This page was last modified on 21 August 2008, at 16:03.